I don’t wake up well. When I go to sleep, I sleep. My body and mind shut down. I have been told that I “don’t answer the phone well” if the call comes too early. The Commanding Officers I know all wake up well. It could be three o’clock in the morning and they would pick up and have a conversation as if they were having a cup of tea in their cabins, expecting the phone to ring. I do not sound that way at three o’clock in the morning. They say nothing good happens after midnight, and for the skippers of ships that is always true. Based on my dreams, there are some creepy things out there, but none of them compare to the things a CO hears late at night. Which is why I could never command a ship at sea. 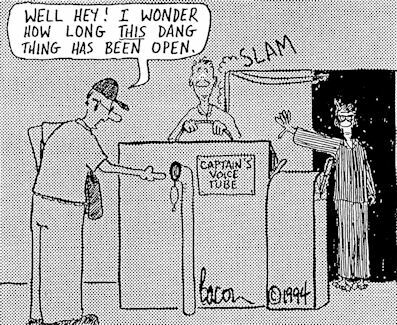 The Captain must always be alert, and always accessible to the watch standers who need his (or her) experience and advice. My place was among the crew, where I could be assured of a good night’s sleep. And if for whatever reason that wasn’t possible, at least I had a little more flexibility to deal with the issue.